Attending drug rehab is a big step, and it can come with apprehensions, fears, and misgivings. One of the best ways to relieve your anxiety about taking the step of attending a residential rehab program is to understand what to expect. 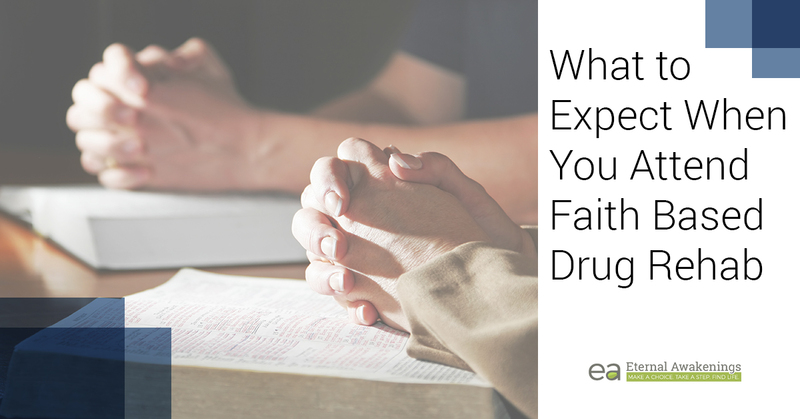 If you’re unfamiliar with Christianity or don’t know what a faith-based rehab program involves, it will help to inform yourself beforehand what you will experience. Here are some things you should expect to find when you attend a Christian-based rehab program. The Bible is the main text for Christians, and we consider it to be more than just good advice — we believe that it’s God’s Word. Therefore, it is the supreme authority in a Christian’s life, and it shows us how we ought to live. At minimum, you’ll understand why the staff views things the way they do and why they make the decisions they make. We want our lives to line up with the Bible. You will hear and understand the Bible’s core message, called the gospel, and you’ll have an opportunity to respond to that message. You’ll learn principles of wisdom and knowledge from the Bible that will help you to live your life well. Worship is the soul’s natural expression of delight, wonder, thankfulness, and awe. When we see or hear something that we find to be beautiful, compelling, or awe-inspiring, we respond or react in some way. Christians worship God because we find Him to be the delight of our souls and the love of our hearts. Worship often takes the form of music that we sing to God, but it can also take many other forms, such as the spoken word or even silent awe. Prayer is simply talking to God. Christians pray, not because we think that God wouldn’t know what we wanted to say, but because He asks us to ask. However, prayer is not just asking God for things. It can also be telling God how much we love him, expressing our thanks to Him, or confessing our sin to him. Depending on the individual faith-based rehab program, church attendance may or may not be required. Here at Eternal Awakenings, we expect each member of our program to attend church at Living Waters Fellowship while you are part of our program. We believe that this is important because the church is the spiritual heart of our program. We’re confident that as you attend, you’ll be blessed by the Holy Spirit as you worship alongside other people from all walks of life. Our services are on Sunday mornings from 10:30 AM to Noon and on Wednesday evenings from 7:00 to 8:30 PM. One essential part of rehab is counseling, and faith-based programs are no different. You can expect to have group and individual counseling sessions where you explore topics that challenge your thinking, show you a new way of approaching situations, or work to repair old wounds and hurts that you have suffered. Have you ever been frustrated by people whose behavior was so unpredictable, you never could quite know how to behave when you were around them? Perhaps it was a parent who praised one child for an action, and then yelled at another child for the exact same action, or perhaps it was a supervisor, teacher, or partner whose behavior and communication was always moving around. This is the exact opposite of what you should expect at a faith-based rehab program. Christians value honesty, truthfulness, and transparency. These values will be reflected in the way that the programs are set up. Communication should be forthright, with clear expectations and no hidden traps or clever wording or fine print that means the opposite of what you would think. It’s a very common thing in faith-based addiction recovery programs to give each client a job or a task or an assigned area in the house, such as dishes, cleaning bathrooms, vacuuming, laundry, or yard work. Your participation in household jobs is NOT random. Work is one of the fastest ways to reveal to you the areas that you need to work on. For instance, if work makes you want to fume with anger, that’s a detail that should trigger you to ask, “Why?” Is it because of the person you’re assigned to work with? Is it because of a bad memory associated with that task? Is it because it infuriates you to be told what to do? If you can get to the root of these issues and work them out during your rehab program, they’ll have less power to cause a relapse once you go back home and run in to the need to work. Here at Eternal Awakenings, we have a two-hour window for “Dust Busters” on Saturdays, where all participants will engage in cleaning and chores. Please contact us for more information about what kinds of tasks are expected of our participants on a daily basis. At faith-based rehab programs, you should expect the staff to administer consequences in a way that’s consistent, calm, just, and kind. If the rehab program requires everyone to make their beds, and holds a daily inspection to check, then you can expect them to administer consequences if they find an unmade bed. For example, that person might be assigned extra dishes duty. The consequences that you should expect from a faith-based rehab should always fit the crime and never be harsh or unusual. Fulfilling your expected duties is part of building trust, and we want to establish and promote mutual trust and respect in all participants. There are lots of ways to have sober fun, and your rehab program should take into account that you have a need for some downtime. Most faith-based rehab programs offer some kind of outings, activities, and entertainment from time to time, and they should be able to tell you about what kinds of fun and recreation they do. Our Christian rehab program is for both men and women, and we offer treatment for recovery from drug and alcohol addiction at our beautiful, historic mansion in Gonzales, Texas. To start the enrollment process, please call our free helpline at 888-672-0298, or contact us through our online form. We look forward to serving you!